Blythe Corbett’s insights may be unique among researchers developing new interventions for children with autism spectrum disorders – at the M.I.N.D. Institute or elsewhere. Corbett’s Social Emotional NeuroScience Endocrinology (SENSE) lab focuses chiefly on analysis of the behavioral and biological effects of the stress hormone cortisol on children with autism. But her work is informed by the eclectic professional experience of someone with a background in autism diagnosis, brain analysis, behavioral intervention – and acting. In her quest for enhanced assessment and treatment of the social-emotional capabilities of children with autism, Corbett has focused on responses of the stress hormone cortisol during various potentially stress ful settings, including playground interactions. With playtime periods discreetly videotaped for later moment-by-moment documentation of their behavior, a child with autism and a typically developing child are teamed with a “confederate” child who works with the researchers. They’re given various play opportunities, with their cortisol levels checked before and afterwards to assess their level of stress. “Although there is a great deal of variability in stress levels among children with autism, many of our subjects seem to find playground interactions stressful–even kids who appear to be enjoying themselves,” explains Corbett. cortisol rhythms and responses raise many questions: Do those with autism have heightened sensory sensitivity, leading to heightened stress? 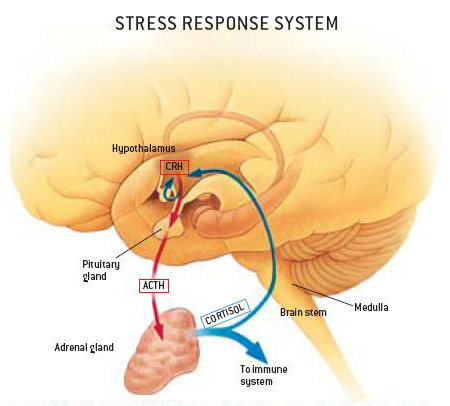 Do they have a genetic predisposition to stress? What are the characteristics of the children who show high versus low levels of stress? scripts for typical conversations, have a safe place for repeating those scripts and for developing friendships with peers their own age – and feel the sense of pride that comes from receiving applause from an appreciative audience. The project also helps develop the concept of video modeling, a tool that allows children with autism learn the behaviors of typically developing children by seeing them on video and repeating their behaviors. SENSE Theatre productions utilize youth actors as expert models who, as part of the rehearsal process, perform the roles in which the children with autism have been cast. In addition to working with the child during the rehearsals, these typically developing actors are videotaped in rehearsal performing the roles, and the children with autism are encouraged to study those videos from home. For performances, the typically developing actors are cast in different roles, giving them the chance to shine in front of audiences, too. For more information about Blythe Corbett's SENSE Theater, visit their website at: SENSEtheatre.com. Reprinted with permission from UC Davis M.I.N.D. Institute "M.I.N.D. Matters"